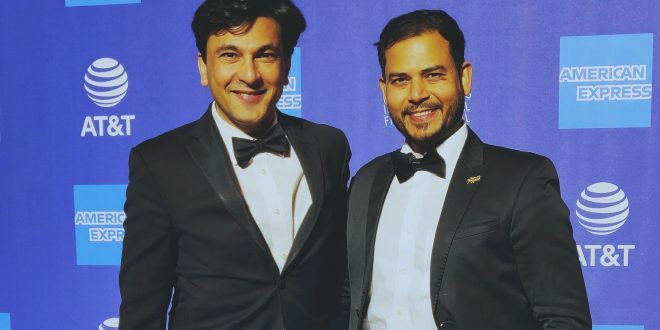 Bhubaneswar: Odisha born producer and promoter Jitendra Mishra’s latest feature film production ‘The Last Color’ directed by celebrity Chef Vikas Khanna, starring veteran actress Neena Gupta, has had it’s world premiere at the prestigious 30th Annual Palm Springs International Film Festival 2019 recently. The film was screened twice at Regal Cinema & Mary Pickford D’place, Palm Springs with hall packed audience and standing ovation. The film, which also marks Khanna’s debut as a director and screen writer is based on his bestselling book by the same name. This year, the festival was studded with Hollywood starts like Jim Carrey, Bradley Cooper (A star is born), Spike Lee (BlacKkKlansman), Glen Close, Alfonso Cuaron (Roma), Melissa McCarthy, Rami Malek , Emma Stone and many others. The festival opened with multiple Oscars & Golden globe nominated Kenneth Branagh’s “All is true” and the closing night film was Oscar-nominated writer/director Bruce Beresford’s “Ladies in Black”. The film has been produced by Bindu Khanna, Poonam Kaul and Jitendra Mishra under the banner of House Of Omkar. The Cast comprises of Aqsa Siddiqui and transgender activist Rudrani Chettri apart from Neena Gupta. Interestingly, some of the pivotal roles in the film have been played by first time actors based in Varanasi. The captivating theme music with Indian musical undertones as well as the background score has been created by a team of musicians led by Elliot Middleton, renowned for instrumental and cinematic theme creations. Elliot is based in LA. The teaser of the film was unveiled at the Cannes Film Festival 2018 earlier this year. Jitendra Mishra, the producer of ‘The Last Color’, said, “We are privileged to get official selection in one of the biggest and most credible festivals but I think we achieved our goal when the hall were packed with right kind of audience and the film got a standing ovation at the end. We have already got invitations from many other festivals after this. The credit goes to Vikas Khanna who is the creator of this great piece of art. His creativity, dedication and hard work have made it happened. I am fortunate enough to get associated with such a fantastic film”. Jitendra Mishra, born in Titlagarh, is a multiple award-winning film producer and promoter. He has already been associated with more than 110 films in all categories and in various capacities. He has been invited to many credible international film festival as eminent jury and currently on the board of directors for world’s biggest and oldest children media network CIFEJ and member of the Cannes Producers network. He is also the festival director of the unique film festival SIFFCY which he has conceived & designed for Smile Foundation.